MSL Property Care Services have completed a 502 mile bike ride from the Piece Hall in Halifax to the Arc de Triomphe in Paris to raise as much money as possible for the local Home-Start charity. MSL Property Care Services have completed a 502 mile virtual bike ride from the Piece Hall in Halifax to the Arc de Triomphe in Paris to raise as much money as possible for the local Home-Start charity. 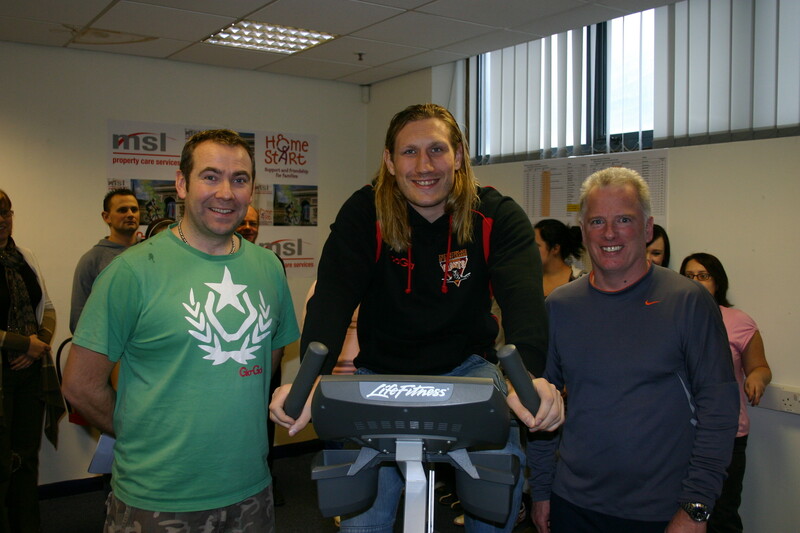 MSL staff, aided by volunteers from Home-Start, cycled in a continuous relay for 28 hours on a static bike in their offices. The cycle team were assisted by Huddersfield Giants and England rugby league star Eorl Crabtree who cycled down the Champs Elysees to cross the finish line under the Arc. “As a progressive company we are committed to supporting a charity that does invaluable work in the local community. MSL recently donated upgraded kitchen facilities for Home-Start but the bike ride has given all staff the opportunity to get involved and raise money whilst meeting a challenge and having fun,” said MSL Managing Director Jeremy Harrison. Home-Start Calderdale was established in 1999 and offers support to parents with young children across Calderdale. It recruits and trains volunteers to visit families at home to provide informal and confidential support.